Las Vegan Joe Sullivan is third on the St. Lawrence University hockey team in scoring with eight goals and 17 points. More important, he’s doing the things centers need to do to be effective. Las Vegas native Joe Sullivan takes a shot for St. Lawrence University during a Dec. 9, 2016, game against Colgate (Photo courtesy St. Lawrence University). 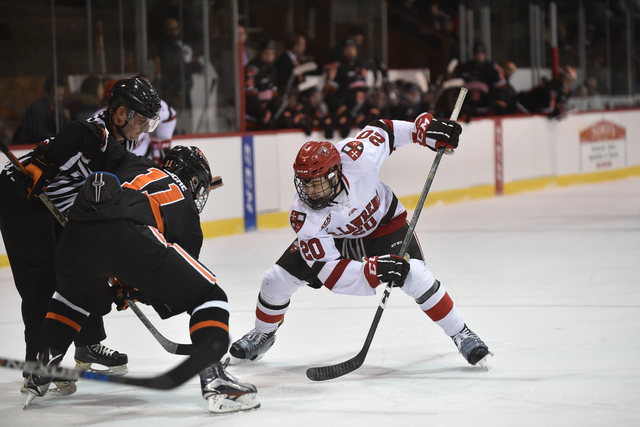 Las Vegas native Joe Sullivan takes a faceoff for St. Lawrence University during a Nov. 4, 2016, game against Princeton. (Photo courtesy St. Lawrence University). Whenever a team changes coaches, established players often don’t know what to expect and it can lead to trepidation. Do I have to prove myself all over again? Is my resume good enough to provide some security? Will the new style of play fit my skills? Those questions and others were going through Joe Sullivan’s mind after Mark Morris was named coach of the St. Lawrence University hockey team last spring, replacing Greg Carvel, who left to become coach at Massachusetts. Carvel had recruited Sullivan, a 5-foot-10-inch center from Las Vegas. Not only did Sullivan make a positive impression on Morris, but he also has become one of his favorite players. Because of injuries to the team’s top two centers, Morris moved Sullivan from right wing to center early in the season, and Sullivan has delivered. The 22-year-old junior is third in scoring with eight goals and 17 points for St. Lawrence (10-5-4). More importantly, he’s doing the things good centers do. He is winning more faceoffs. He has been responsible in the defensive half of the ice. He has avoided a prolonged slump and not dragged down his linemates. Morris has become a big fan. Sullivan had to leave Las Vegas to get the necessary competition to improve his game. He had played midget hockey for the Las Vegas Storm and left in 2011 to play junior hockey for the Wings in Aberdeen, South Dakota. It was a culture shock on several levels. He also got a taste of the business of hockey. During his second year with the Wings, he was traded in midseason to the Wenatchee Wild, not an easy adjustment for an 18-year-old. The following year, Sullivan climbed to the top tier of American junior hockey, the U.S. Hockey League. He had 22 points for the Indiana Ice in 2013 and drew the attention of college coaches. He was offered an opportunity at Bemidji State in Minnesota, and Army also was interested. Instead, Sullivan selected St. Lawrence, which is in Canton, in upstate New York, and has a history of hockey success. Sullivan, a math and economics major, is carrying a 3.50 GPA. Socially, he said he has fit in well in a place where the average wintertime temperature hovers around 16 degrees. When it’s that cold, it’s an easy decision to stay inside and study. Sullivan said college hockey is more intense than juniors and is a tighter checking game. He’s had a chance to see the world with the Saints. The team played in Switzerland and Italy during his sophomore season. 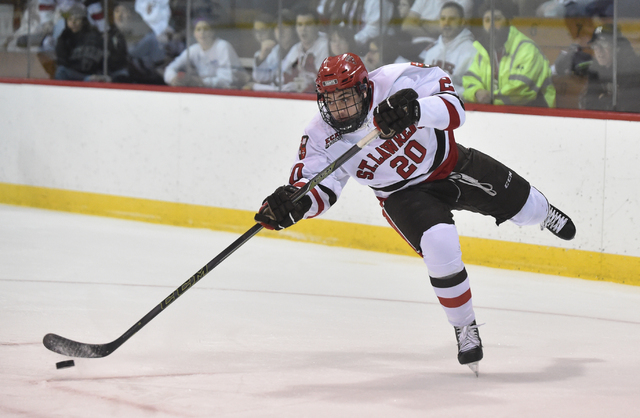 In October, St. Lawrence played in a four-team event in Belfast, Northern Ireland, getting a tie with Quinnipiac and Massachusetts. As is the case with most people in the Las Vegas hockey community, Sullivan is excited about the NHL coming to the valley and the Vegas Golden Knights’ inaugural season in October. “Growing up here in Vegas, we never thought we’d have an NHL team,” said Sullivan, a lifelong New York Rangers fan whose parents were season-ticket holders when they lived on Long Island. “I still can’t believe we got one. Sullivan is one of three Las Vegans playing Division I hockey this season, along with Michael McNicholas, a junior forward at New Hampshire, and Joey Raats, a sophomore defenseman at Arizona State. Sullivan thinks that could change with the arrival of the Knights. PLAYING CAREER: Las Vegas Storm Midget-16 AAA, 2010-11; Aberdeen, South Dakota Wings (NAHL), 2011-13; Wenatchee, Washington Wild (NAHL), 2012-13; Indiana Ice (USHL), 2013-14; St. Lawrence University (ECAC), 2014-present. DID YOU KNOW? : Sullivan ran track at Spring Valley High School, competing in the 400 meters, 800 meters and 300 hurdles.